Congratulations to these groups of outstanding students for their achievements at AME and their great accomplishments! 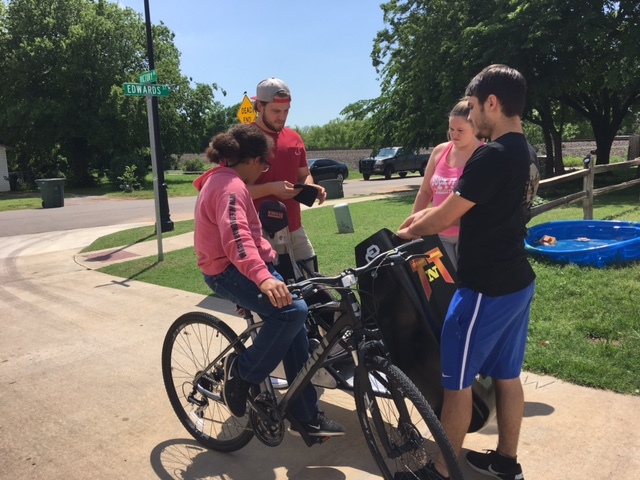 The Bass Family asked the team to find a way to allow their son, Titus, who is physical and mentally handicapped, to participate with their other son, Tobias, in the cycling portion of a triathlon. It is Tobias’ dream to be the youngest person to complete the Ironman triathlon while accompanied by a disabled partner. 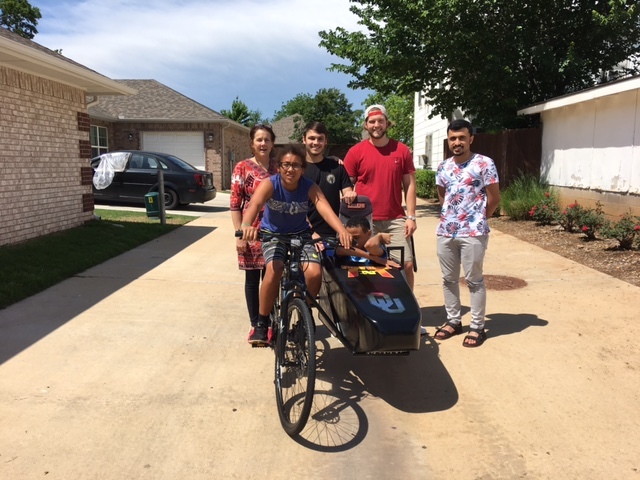 After meeting with the Bass Family and researching several ideas, the team decided to follow through with a sidecar design for Tobias’ bike. The sidecar includes a steel frame, fiberglass nose shell, and arms that can detach from the frame of the bike. The fiberglass nose shell is connected to the front of the sidecar frame by hinges, allowing the shell to open and close. This will make loading Titus in the sidecar an easy task. The sidecar is attached to the frame of the bike with attaching arms that have clamps at the end. These clamps allow the user to attach and detach the sidecar. The position of the third wheel of the sidecar is also adjustable. The height and lateral position of the third wheel can be adjusted using similar clamps. A 3D model of the sidecar frame was designed in SolidWorks. Several loading simulations were performed on the frame using ANSYS to ensure safety. 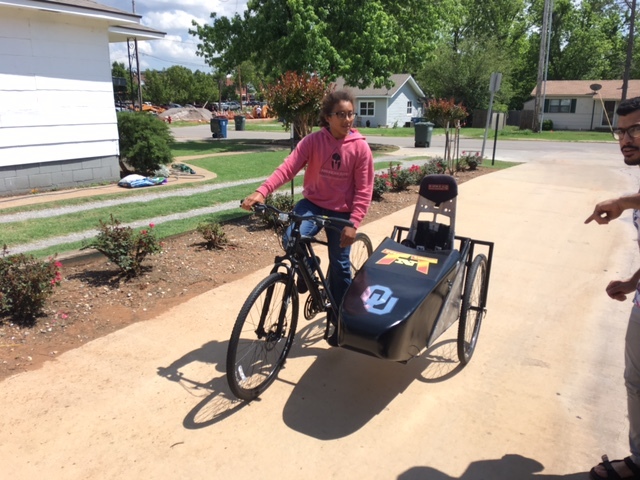 The results of the FEA showed that under the loading conditions, the sidecar frame would remain a safe option for Titus. Tests on the actual prototype were also done by the team. Again, the results showed that the sidecar was safe. 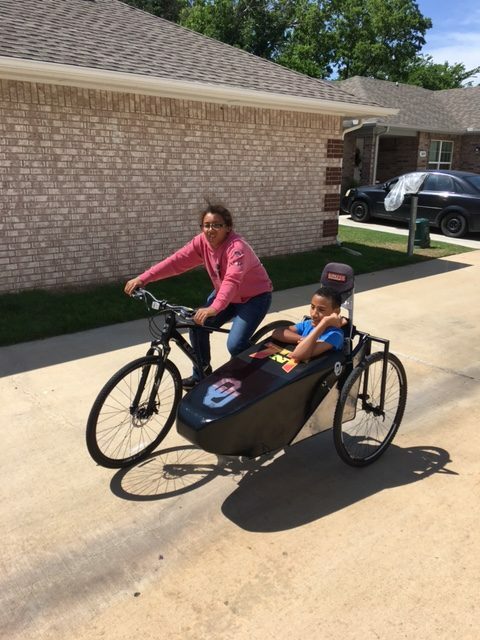 The sidecar designed and manufactured by the team provides Titus and Tobias a light-weight and low-cost solution to their initial problem. 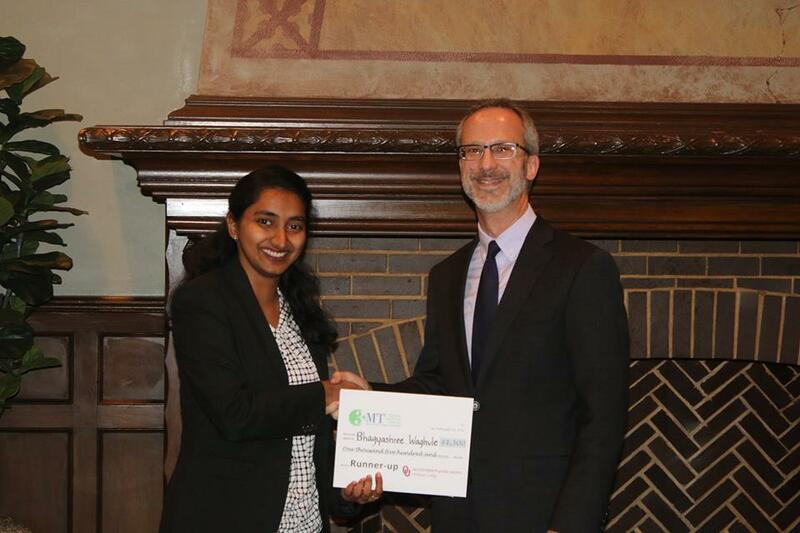 Congratulations to Anand Balu Nellippallil for receiving the top award! 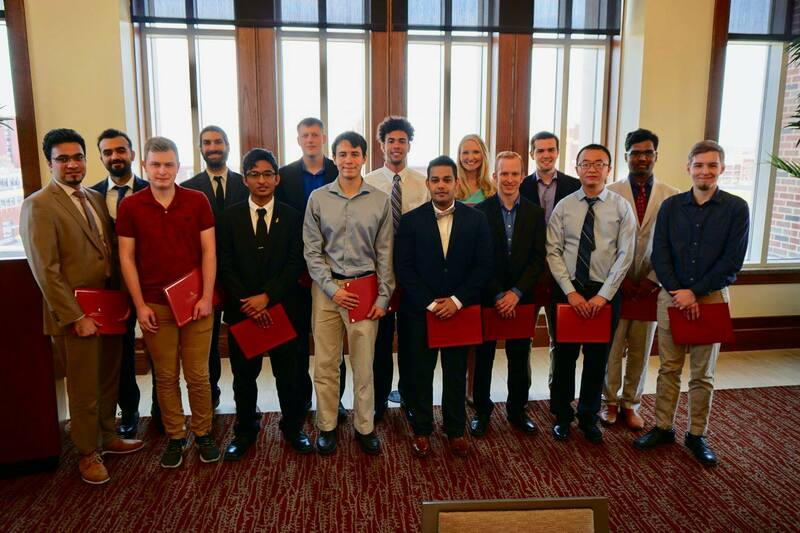 The School of Aerospace and Mechanical Engineering recently celebrated the end of the school year with their annual Spring Senior Luncheon in conjunction to the Spring Board of Advisors’ (BOA) meeting. During the luncheon, Tommy Lear, BOA Chair, gave a keynote presentation. AME also celebrated the seniors and bid them farewell and good luck in their future endeavors. 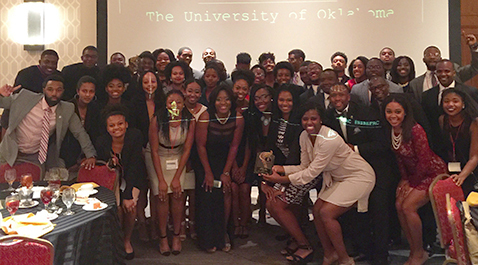 Lastly, AME honored two special groups of students. 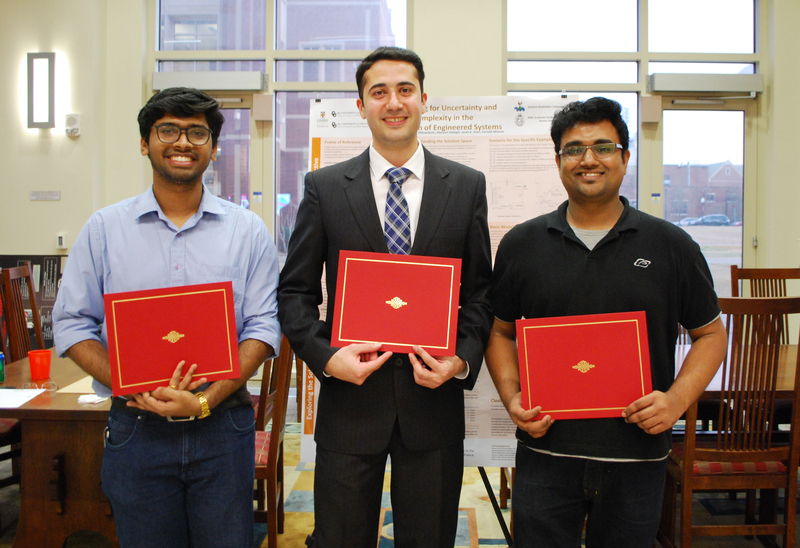 The first was the AME Undergraduate Outstanding Students and the second was the Graduate Student Scholarship Recipients. Outstanding Students (left to right): Joel Jimenez Cortez, ME Outstanding Junior; Nathan Justus, AE Outstanding Senior; Jordan Logue, AE Outstanding Junior; Dickens Danson Mugumya, AE Outstanding Sophomore; Octavio Serrano, ME Outstanding Sophomore; and Tim Willis, ME Outstanding Senior. 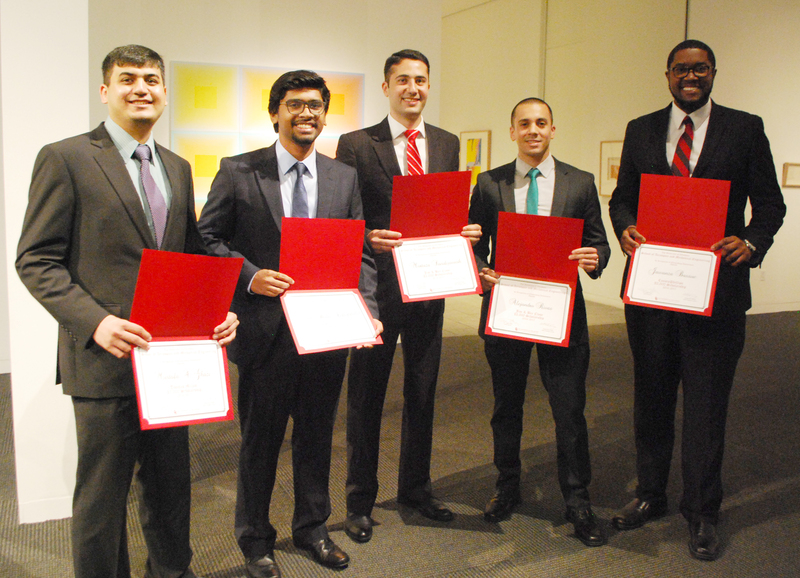 Graduate Student Scholarship Recipients (left to right): Mustafa Ghazi, Thomas Milam Scholarship; Anand Balu Nellippallil, Frank Chuck Mechanical Engineering Scholarship; Mortaza Saeidijavash, Jim & Bee Close Scholarship; Alejandro Rivas, Jim & Bee Close Scholarship; Jawanza Bassue, ConocoPhillips Scholarship; and (not pictured) Jelena Milisavljevic, Close and Francis Family Scholarship. Congratulations to the recipients, and good luck to the seniors! 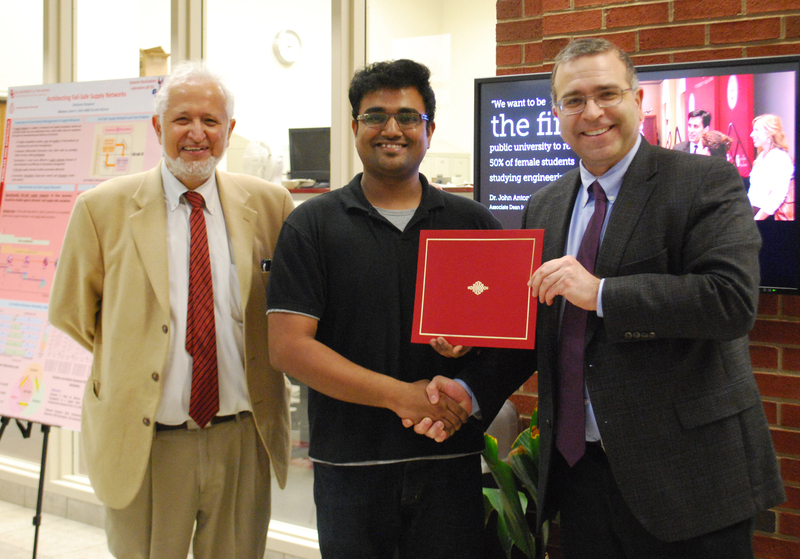 Andrew Kocarnik is pictured on the right with his third place certificate. 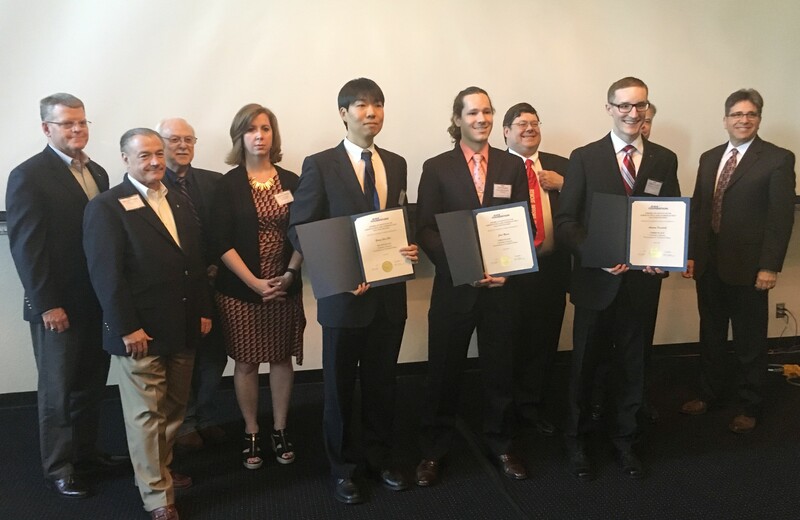 AME Graduate Student Andrew Kocarnik recently participated in the AIAA Region IV Graduate Student Paper Competition receiving third place. 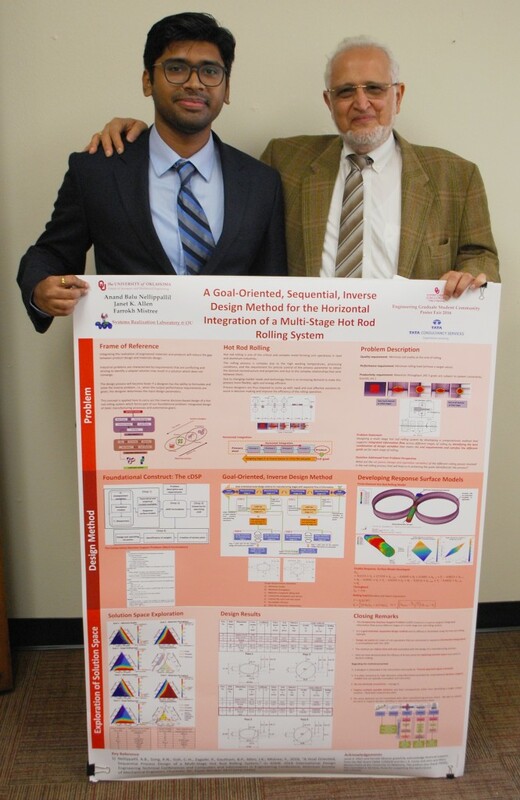 His paper is titled, “Analysis of the Momentum Method and Blade Element Theory as Applied to Rotorcraft.” Andrew is currently pursuing his M.S. in Aerospace Engineering at OU. As a third place winner, Andrew received a $250 cash prize. In the spring of 2015, Dave and Susan Bert made a generous donation to the School of Aerospace and Mechanical Engineering for the creation and renovation of a graduate student team room in the Engineering Laboratory. Upon completion of the renovation, the team room was named The Dave and Susan Bert Team Room. 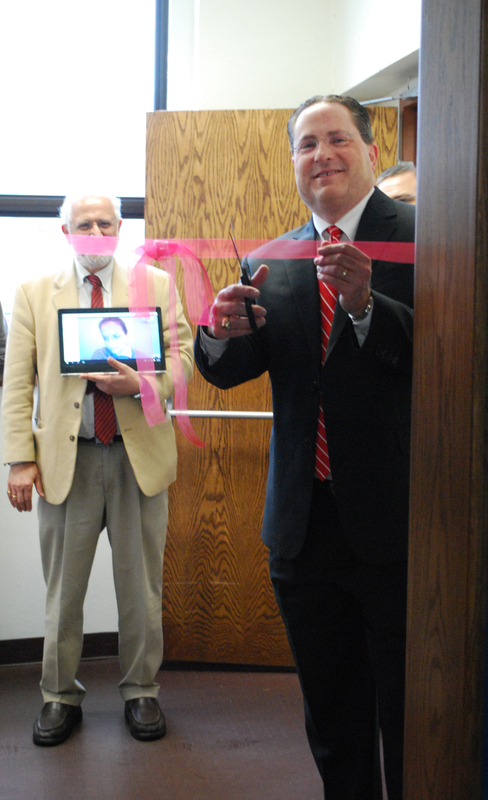 An official unveiling and ribbon cutting ceremony was held on Monday, March 7, 2016 with Dave Bert, members of the Graduate Student Community, AME faculty and AME staff in attendance. The Dave and Susan Bert Team Room was completely renovated from top to bottom with new carpeting, tables, glass boards, and much more. The room was created as a multipurpose space for AME graduate students for group meetings, presentations, study groups, a lounge, and much more. 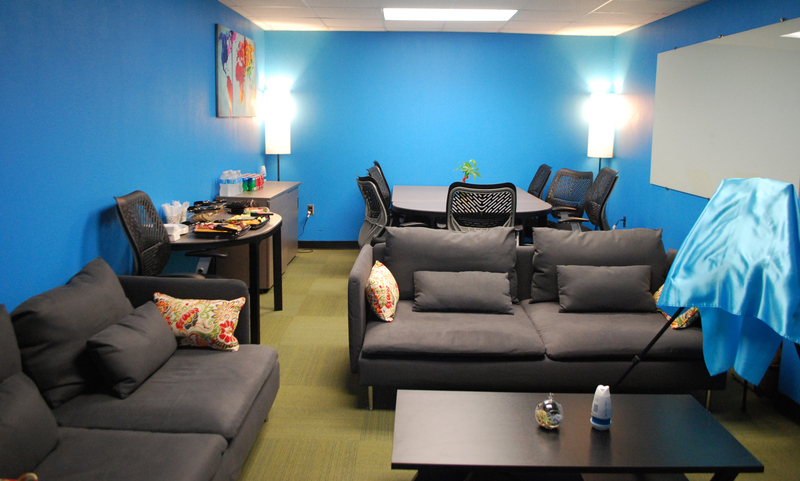 The Leadership Team of AME’s Graduate Student Community worked together to design and create The Dave and Susan Bert Team Room. 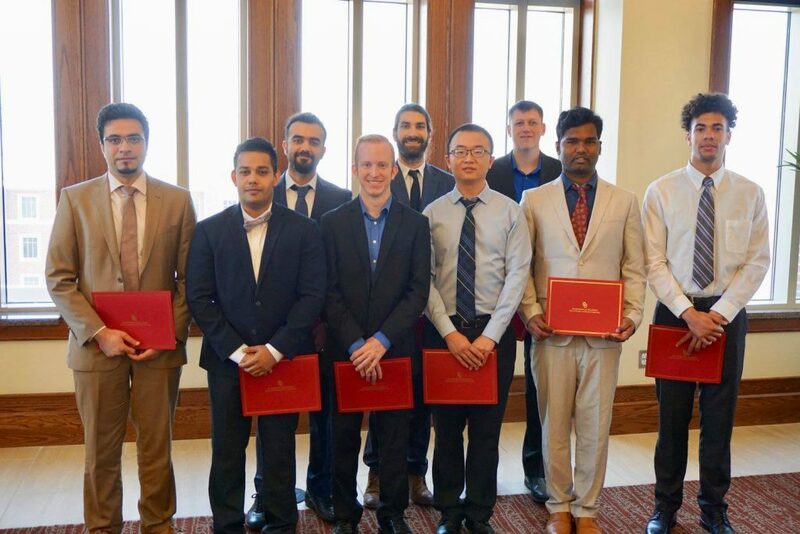 Jelena Milisavljevic led the graduate students in coordination of the team room with fellow GSC peers, including Jackson Autrey, Arun Balakrishnan, Luke N. Balmer, Jawanza N. Bassue, Amber L. Kapoor, Anand Balu Nellippallil, Oluwaseyi T. Ogunsola, Stewart E. Ohler, Mahyar Pourghasemi, Maryam Sabeghi, and Mortaza Saeidi. In addition to the graduate students, M. Cengiz Altan, AME Director; Farrokh Mistree, GSC Faculty Mentor; Melissa Foster, Danielle Geier, Debbie Mattax, Billy Mays, Rebecca Norris, Kate O’Brien-Hamoush, and Greg Williams, AME Staff; assisted with the renovation. The Bert family is one of loyal distinction to AME. Dave Bert is the son of the late Dr. Charles W. Bert, who served as a faculty member at AME for more than 40 years and also served two terms for a combined 11 years as AME Director. 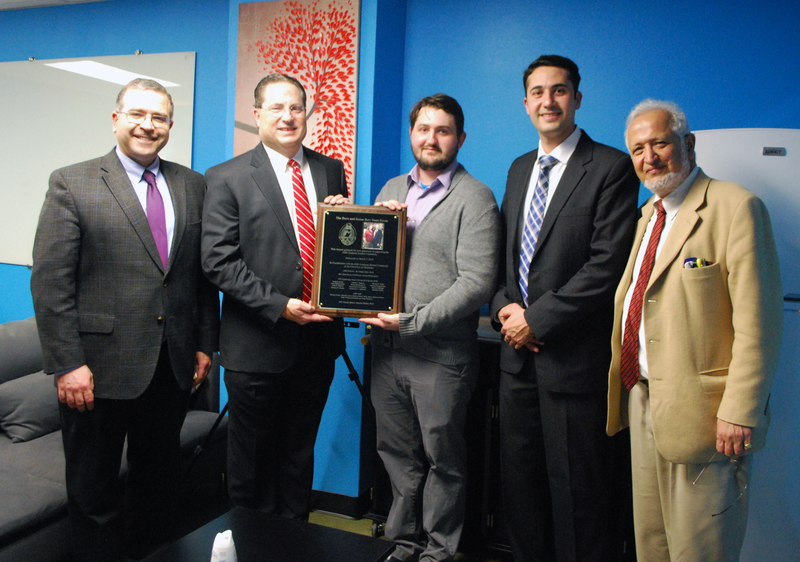 In addition to Dr. Bert’s legacy at AME, Dave Bert and his family continue to leave their mark. Dave is the Vice President of Drilling for Chesapeake Energy Corporation. 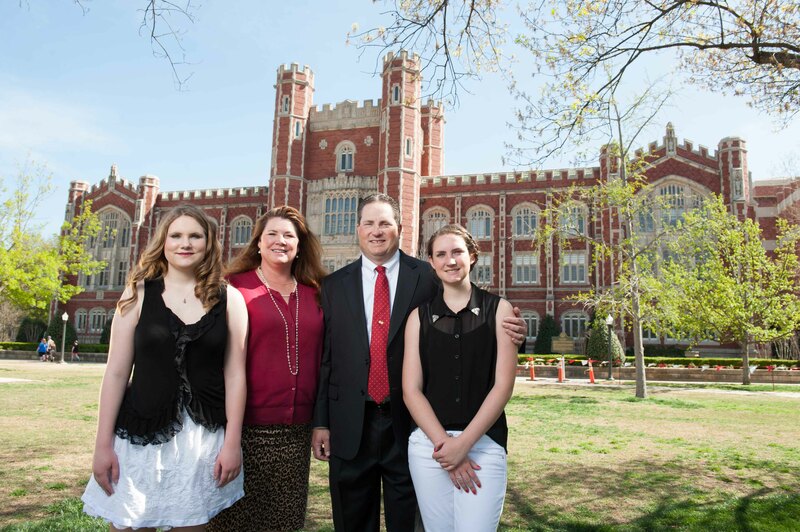 He graduated with a Bachelor of Science in Mechanical Engineering from OU AME in 1985. Dave has been a member of AME’s Board of Advisors since 2003 and has also served as Chair. He also serves as a member of the Gallogly College of Engineering Advisory Board. 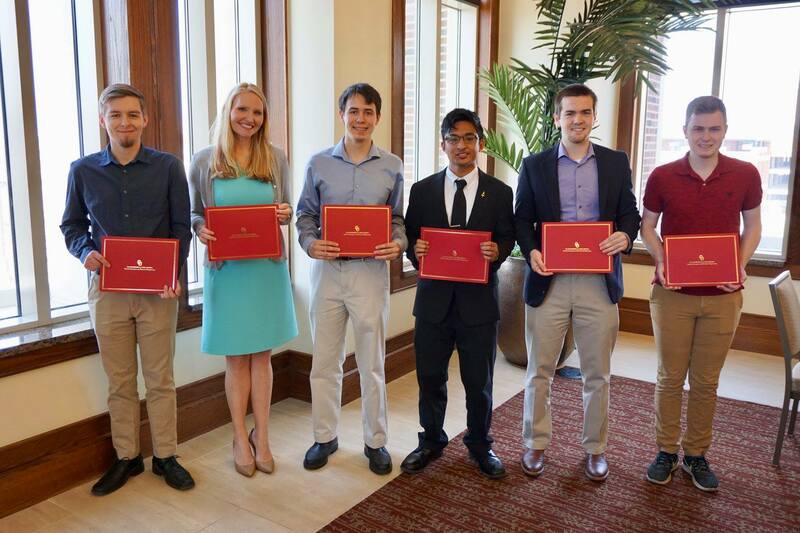 In 2012, Dave was inducted into the University of Oklahoma Gallogly College of Engineering Distinguished Graduates Society. Dave and Susan Bert have been married for over 25 years. They have two daughters, Bailey and Brianna. The Bert family resides in Edmond. Bailey attends the University of Arkansas and plays the piccolo in the Razorback Marching Band. Brianna and Susan play competitive tennis and enjoy volunteering. Dave enjoys reading, civic and sporting activities. The family enjoys watching Oklahoma City Thunder basketball games together, church activities, and traveling. The AME Graduate Student Community, as well as its faculty and staff, would like to thank Dave and Susan Bert for their generous donation! 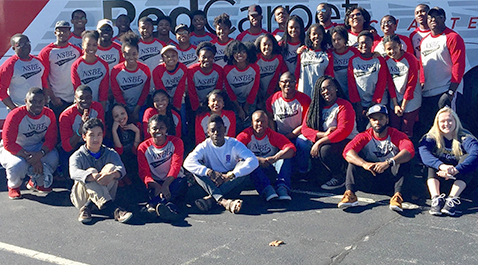 Because of donors like you, AME will continue to provide the best educational experience for our students! On Monday, March 7, 2016, the AME Graduate Student Community hosted a Graduate Student Poster Fair. 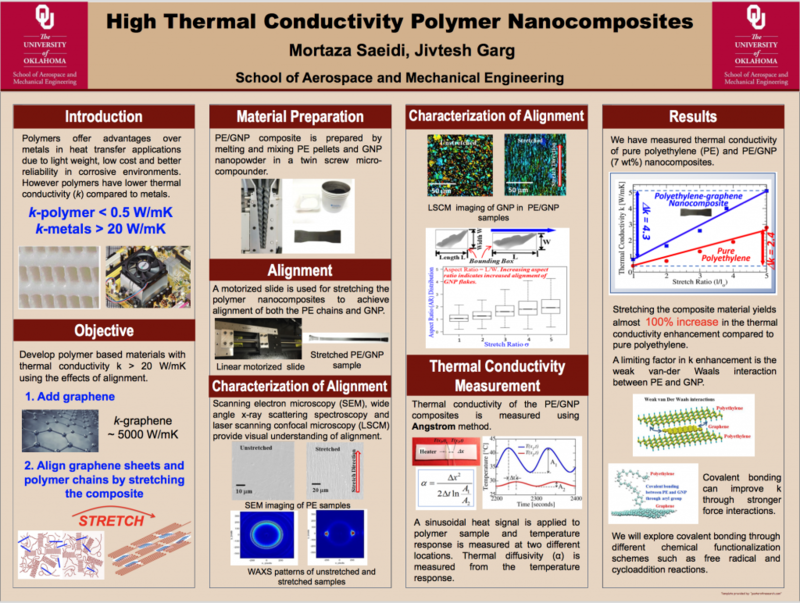 Students presented their research to a panel of judges. 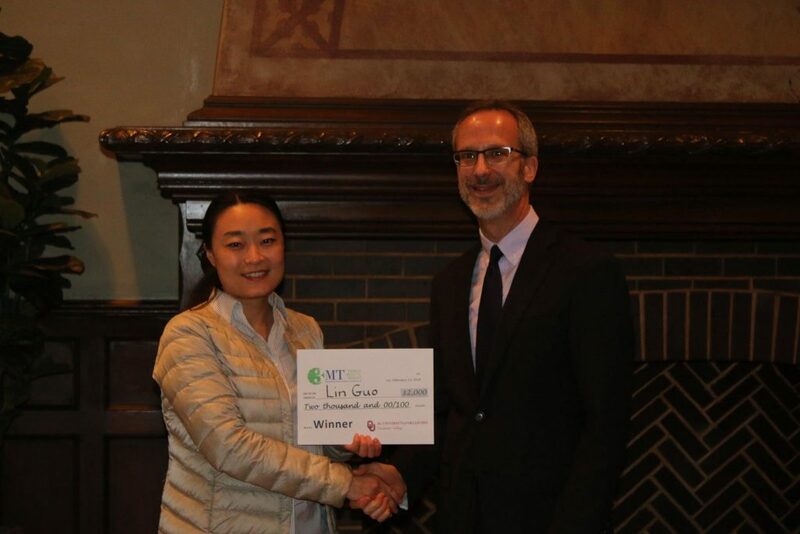 The team of judges included AME faculty Andrea L’Afflitto, Yingtao Liu and Kuang-Hua Chang, and AME Board of Advisors members Dave Bert, Tommy Lear and Matt Green. 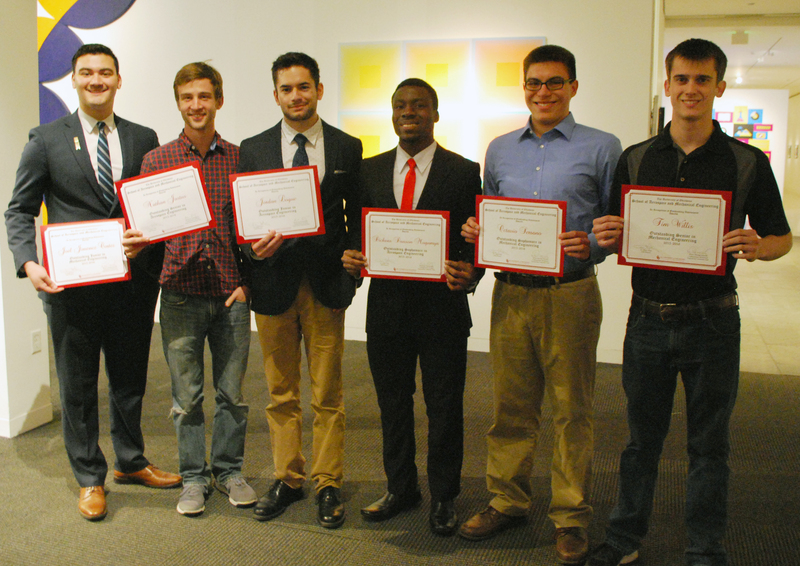 The judges rated each presentation and selected first, second and third place winners. Anand Balu Nellippallil received third place with his research titled An Inductive Method for the Exploration of Solution Space for Studying Thermo-Mechanical Behavior of AA 5083 Aluminum Alloy during Hot Rolling. 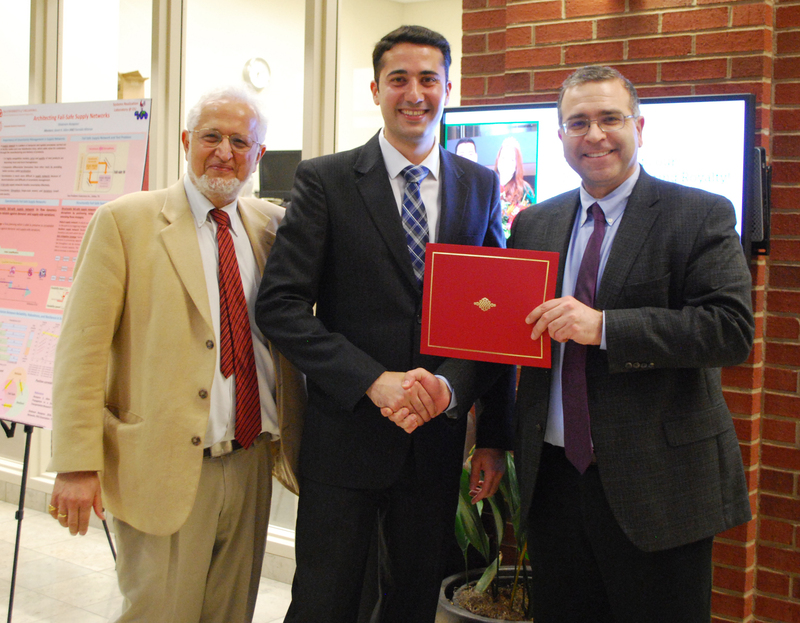 Mortaza Saeidijavash received second place with his research titled High Thermal Conductivity Polymer Nanocomposites. 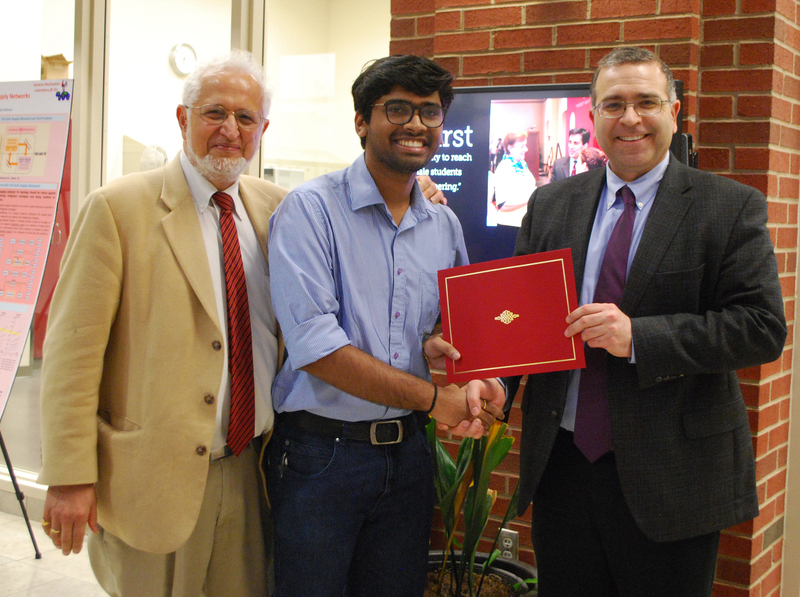 Arun Balakrishnan received first place with his research titled Effects of Degree of Fuel Unsaturation on NOx Emission Form Petroleum and Biofuel Flames. Congratulations to the winners and to all the participants! To view more photos of the GSC Poster Fair, please visit the AME Facebook Page.